Did you know that 35% of what a lawyer does in the first two years of practice is legal research? Studies also show that the majority of those hiring new attorneys see new associates’ research skills as lacking or severely lacking. 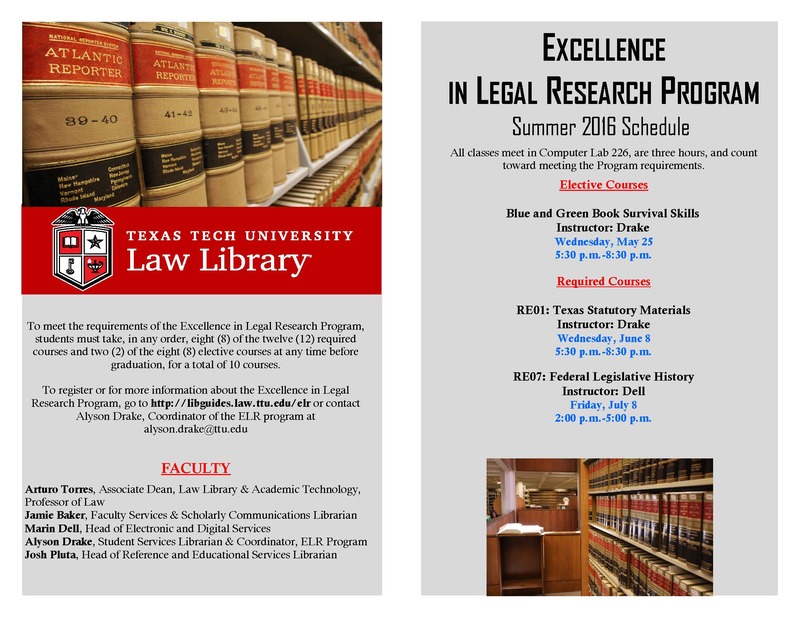 The award winning Excellence in Legal Research Program at Texas Tech Law is a great way to strengthen your research skills before you enter the legal profession. If you are currently a 1L or a 2L, it is still possible to complete the ten courses that will give you a bright spot on your resume and a leg up on those applying for the jobs you want. This summer, we are offering THREE classes (see below). Contact Alyson Drake, the Coordinator of the ELR program, at alyson.drake@ttu.edu to sign up for the classes, and keep your eyes open in August for the fall schedule. Next Next post: Legislative Insight: What is it?